In week from 06/01/2012 to 11/01/2012 week total 7848 visitors, 31 Primary Schools, 11 Secondary Schools and 2 Colleges have turned up at the Memorial which includes the public from all walks of life. Western Visitors visited the Memorial from Australia and New York, U.S.A. The British ruled over India for over two hundred years. Many individuals took on the might of the British to free India. Shyamji Krishna Varma chose to take this fight to British soil and made London his base. Shyamji Krishna Varma was born on 4th October, 1857 in Mandvi town of Kutch district of Gujarat. He was one of the foremost freedom fighters in the history of the freedom movement of India with high sense of patriotism and selfless service for the nation. 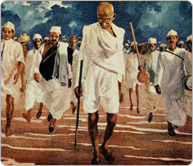 In early April, 1930 Gandhi, 61 years old, reached Dandi after walking 241 miles in 24 days. He then defied the law by making salt. It was a brilliant, non-violent strategy by Gandhi. To enforce the law of the land, the British had to arrest the satyagrahis (soldiers of civil disobedience) and Indians courted arrest in millions. There was panic in the administration and Indian freedom struggle finally gathered momentum both inside and outside of India. January 30- Mahatma Gandhi was attending prayers, he was shot and killed by Nathuram Godse, a 35-year old editor of a Hindu Mahasabha extremist weekly in Poona.